Alphabet Energy, the global leader in thermoelectrics for waste heat to power (WHP), and Heat is Power, the trade association for the WHP industry released statistics in time for the Paris Climate Change Conference (COP21) to help explain just how valuable waste heat can be in generating clean electricity and reducing emissions. Solar and wind have made excellent progress in paving the way for a low-carbon path, but both are limited by low capacity factors resulting from their intermittent nature, producing power only when the sun shines or the wind blows. Waste heat to power is the process of converting exhaust heat into electricity without additional fuel or emissions. Regardless of time of day or wind speed and direction, energy-intensive industries, such as oil & gas operations, industrial manufacturing and transportation, operate around the clock, year-round, and produce enough waste heat to generate over 15 GW of electricity per year, according to ICF and Oak Ridge National Laboratory. While WHP is an emerging technology and installed capacity is not yet on par with that of solar and wind, estimates show that to generate nearly 52,000 GWh of electricity, it takes 22.7 GW of solar compared to only 6.5 GW of WHP due to WHP’s much greater capacity factor. In the U.S. industrial sector alone (e.g., oil & gas, industrial manufacturing), WHP technologies could generate over 120,000 GWh/year of electricity, more than double the nearly 52,000 GWh/year that could be generated from the 22.7 GW capacity for the entire U.S. photovoltaic market (based on a 25.9 percent capacity factor). In the U.S., both House and Senate legislators have introduced the Power Efficiency and Resiliency (POWER) Act that would add waste heat to power to the list of renewable technologies that qualify for the 30 percent federal investment tax credit. More government efforts worldwide can help drive adoption. 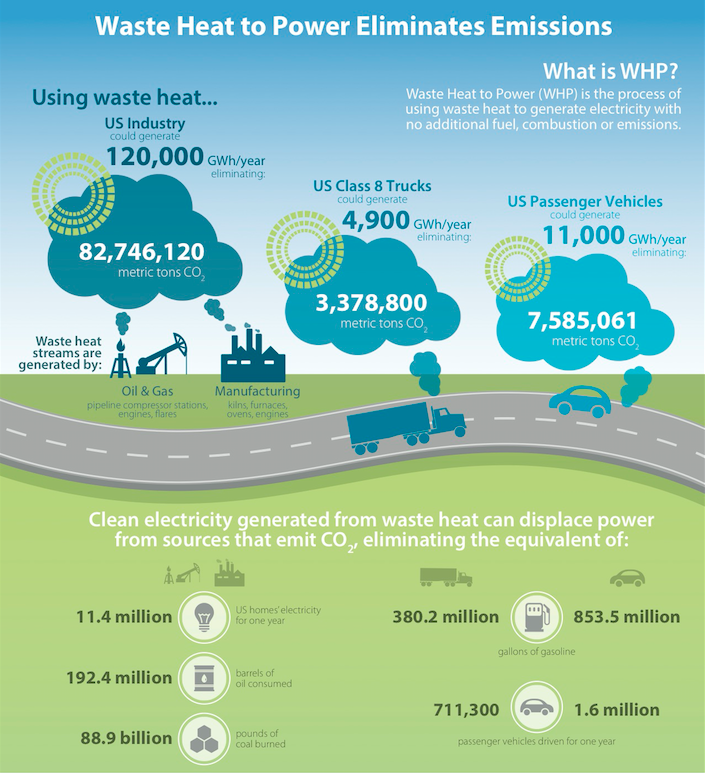 For more information, please view the Waste Heat to Power infographic or Matt Scullin’s recent blog post, Waste Heat to Power as a Carbon Stabilization Wedge. Wow, thank you for sharing how waste heat can be used as a power source. It’s amazing how much innovation companies are making in energy these days.